[시사뷰타임즈] 최소 15명이 부상을 입었는데 그 중 2명은 상태가 심각하며 북부 프랑스의 음악 축제레 떨어진 벼락 때문이라고 관계자는 말한다. 아제르바이잔 비유 까날 음악 축제 현장 여러 곳이 벼락에 맞았다고 이 지역 위원회가 성명을 내고 말했다. 부상자들 중엔 폭풍이 몰아치는 동안 텐트 속에 있었던 어린이들도 있었다. 지역 위원회는 희생자들은 벼락을 직접 맞고 화상을 입었다고 말했다. 60대인 여자 한 명과 44살 된 남자 한 명의 상태가 심각한 것으로 알려졌다. 매년 이맘 때 쯤이면, 프랑스 여러 지역에는 자주 맹렬한 폭풍 주의보가 발령된다. 부상을 당한 사람들은 축제 비상팀으로부터 지역 병원에서 치료를 받기 위헤 이송되기 전 응급 조치를 받았다. 토요일, 예정됐던 모든 공연은 벼락 사건 후 모두 취소됐다. 등장하기로 했던 사람들 중에는 MTV 유럽 뮤직 어워드 최우수 프랑스 아티스트상을 수상한 포니 포니 런런 및 팝 그룹 블랙 본스도 있었다. At least 15 people have been injured, two of them seriously, by lightning at a music festival in the north-east of France, officials say. 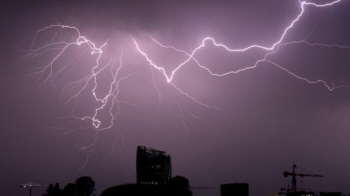 The lightning struck in several areas of the Vieux Canal festival in the town of Azerailles, the regional council said in a statement. Those injured include children who were in a tent during the storm. The victims were "directly hit by the lightning and suffered burns", the regional council said. A woman in her sixties and a 44-year-old man are reported to be in a serious condition as a result of the strikes. Parts of France around this time of the year are often put on alert for violent storms. Those hurt in the latest incident received first aid from the festival's emergency teams before going on to get treatment from local hospitals. All of Saturday's performances were cancelled after the incident. Among those due to appear were French electronic act Pony Pony Run Run and pop group Black Bones.